Is Wellness a good puppy food for my best friend? Hello there, friends! We’ve been waiting for a while to publish our Wellness dog food reviews, and we’re so glad to finally bring you the low-down on what we absolutely, definitely consider one of our favorite brands. Any time we recommend a dog food or puppy food for your loyal sidekick, we always put health first and foremost. For us, that made Wellness an easy choice. Here’s everything you’ll need to be aware of when picking out the best Wellness dog food for your pooch! What’s so awesome about Wellness? 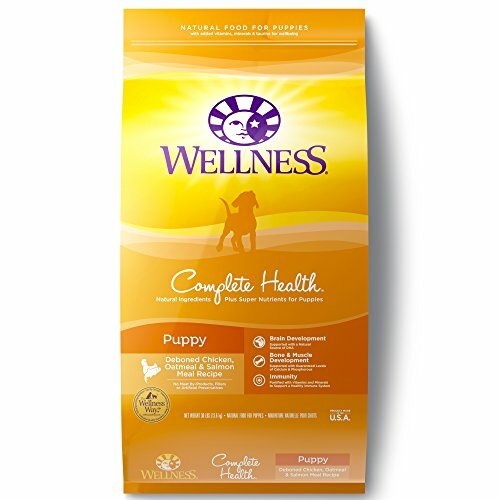 Why the Wellness puppy food and Wellness dog food reviews? Q: What are Wellness ‘meal complements’? Q: I’m not sure how much dog food to feed my growing puppy, can you help? Wellness meets all our criteria for an absolutely fivestar dog food and puppy food maker. For real! When looking for a puppy food or a dog food that’s good enough for our best friends, we focus primarily on whether the ingredients used are natural, of high quality, and healthy. To be fair, we have pretty high standards, and also put lots of effort into whether they’re completely balanced and address the specific needs of differently sized pooches, different life stages, and any special dietary requirements we might have. Having looked at all the nutrient profiles for Wellness, we’re 100% more than satisfied to feed it to our canine companions. Wellness are another brand that’s been developing dog food and puppy food with the help and advice of nutritionists, scientists, and vets. Since the 90’s, they’ve built up a seriously wide range of products so that owners can choose between foods for dogs and puppies with skin sensitivities, allergies, and even food that’s raw-inspired. Weight-management is another area that they cover, alongside even puppies and dogs who can’t handle any potato. Wellness give back to the community, and at the national and local levels, too! The WellPet foundation, established in 2007, focuses on helping dogs and puppies have better lives by supporting non-profits. They help encourage owners to spay their dogs, adopt those without a home, and donate to research so that dogs can play a supportive role to the elderly. Pretty neat, huh? 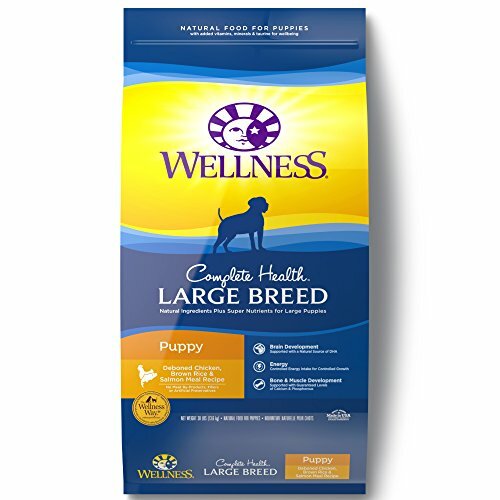 Wellness have a sweet range of four dog food lines, Complete Health, CORE, TruFood, and Simple. The Complete Health line is pretty much a classic, yet well-balanced and holistic range of dog and puppy foods that features grain free alternatives. 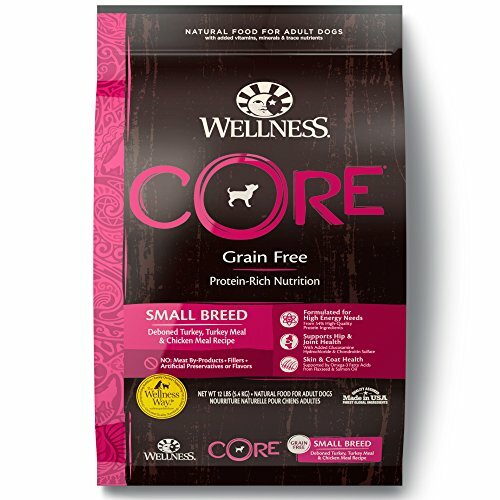 CORE is all grain-free, has pretty lovely and high protein levels for different sized dog breeds and puppies, and you’ll find nutrient-rich salmon in a lot of them. 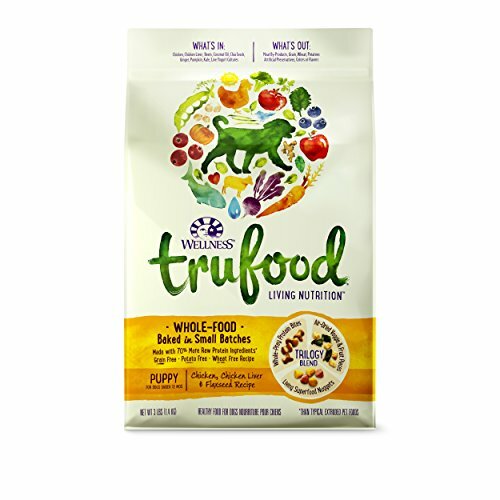 TruFood is excellent for those dogs who need to steer clear of ingredients that potentially act as allergens- so potatoes, wheat, rendered meats, and fillers. Last, but not least, Simple’s crafted especially for puppies and dogs who are best off staying away from certain meats. Here you’ll find the perfect food for a dog with allergies to chicken, or beef, as Wellness use protein from one meat alone- like lamb and duck. highly esteemed as can be with dog owners. Let’s have a look at which Wellness dog food or puppy food is best for your little one! The Wellness CORE range is all about protein, no grains, and great quality natural ingredients. Here’s an awesome grain-free yet tasty chicken dinner for your puppy winner! Chicken plays the starring role, alongside loads of tasty natural spinach, parsley, apple, and even banana for vitamin goodness! Because Wellness are such a health-focused brand, we’re having difficulty finding any weaknesses. Just giving you a heads-up! A grain-free, spectacularly delicious-sounding chicken meal for your little puppy that’s full of DHA, beta-carotene, antioxidants, calcium, vitamins and all-natural meats. It’s super-hard to beat this one! Here’s a similarly excellent, wholesome dinner for your adult, mature dog. Both natural, bone-free and milled chicken are at the very top of this dog food! Free again from grains and all those non-natural additives that we dislike. If you’ve got a dog who’s really suffering from a lot of food allergies, potato in this could be a problem. In more cases than not, however, potato’s just another perfectly hearty and healthy way to get some extra protein! Happy dogs, really happy owners, right? 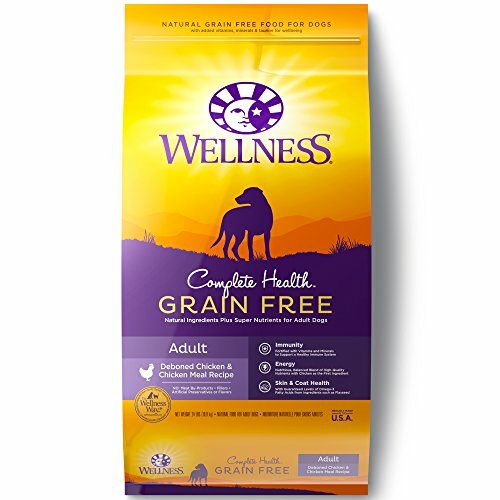 We’ve got nothing bad to say about this Wellness grain-free dog food, in fact, we’d give it five and a half stars if we could! This Complete Health formula’s just great for giving your puppy a super-shiny coat, for supporting their digestion, while ensuring that they get everything necessary nutrition-wise for sharp eyes and dental health. 18% fat gives him all the energy he’s gonna need for running around and playing fetch! Not entirely without grains, as it contains barley alongside oats. 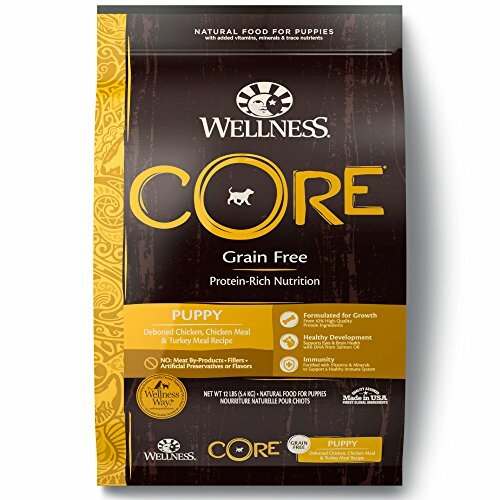 If your dog has any need to be gluten-free, you’re probably better off with the Wellness CORE grain free puppy food we mentioned above. If not, this one’s a perfectly fine- not to mention amazingly healthy and natural- puppy food that puts a tick in all the right boxes for a balanced and yummy diet. We’re looking right at you, giant and large puppy breed owners! Got a Great Dane, Labrador, Pit Bull or German Shepherd? Here’s one formula that’s been crafted with extra care to give your larger (soon to be very large!) puppy moderate yet sufficient protein and fat for a longer growth period. Say Woof for strong canines, and in this case, we mean teeth, cause this one’s got 1.3% calcium. Contains rice, meaning it’s not ideal for those puppies who require a grain free diet. Again, if your puppy’s allergic to grains, this one’s not your top pick. While it’s formulated entirely without wheat or the more common grains including soy, it’s got rice. On the other hand (or paw? ), the ingredients are sourced, preserved, colored, and flavored in completely natural ways. Wellness CORE comes in dedicated formulas for smaller dogs, too. So if you’ve got yourself a Poodle, Yorkie, or Dachshund, here’s a pick for you that will address their specific nutritional and caloric requirements. Nope, we just adore it! This small breed dinner is not only bursting with vitamins, but it’s just as full of those vital minerals like iron, calcium, and copper, which means your dog will be well-protected from dietary deficiencies. It’s also got little bite-sized kibble, so is easier for your toy or small dog to chew. This protein-rich soft food for puppies of all sizes is another veggie-rich and tasty wet food that is full of that wholesome DHA. Zinc, as well as manganese, copper and all part of this naturally-preserved wet food that’s just for puppies! Fat’s at a healthy 7%, and protein’s at 9%. Both are pretty great for wet puppy foods. Paws up for nutrition, and definitely for including real and all-natural veggies! A lovely, savory way to add a little variety, texture-wise, to his mealtimes! This dry puppy formula is for those dogs with particular inabilities to tolerate a lot of foods. So it’s made from raw ingredients that are all-natural, with no grains whatsoever. Forget milled by-products too, this one’s as natural as they come! 30% protein as well as 18% fat- both from natural sources, of course! Antioxidants and your puppy’s requisite minerals are all here! Not suited for those puppies with allergies to egg. 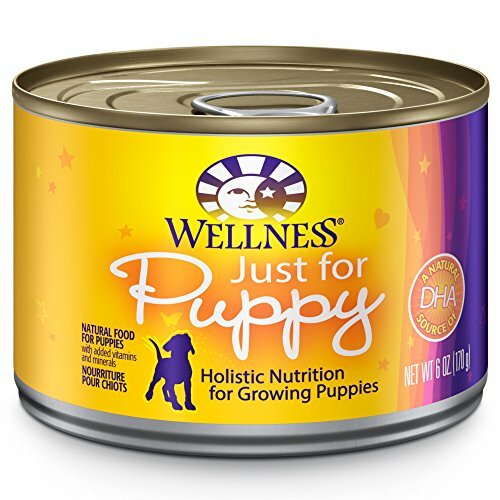 So, all the puppy and dog foods we’ve included in our Wellness dog food reviews and Wellness puppy food reviews have received 5 stars today. This one’s in no way an exception, and we’re super psyched about the raw food ingredients for pups who can’t tolerate certain foods. It’s a darn good hypoallergenic puppy food, that’s for sure. The excellent idea behind the meal complements that Wellness offers is to customize your little puppy or dog’s diet with some creative flair! What this means is, you’ll be able to add a food from their Meal Complements range to jazz up the texture, flavor, and overall awesomeness of their breakfast or dinner. It’s possible to do this yourself, too, with any of the products we’ve deemed worthy for our Wellness puppy food reviews and Wellness dog food reviews. All you need to do is mix a little water around in his kibble, or mix his kibble with some soft or wet food, and you’re already spicing up his mealtimes. Food rotation is another awesome way to keep things interesting for a puppy and can help ensure that they’re getting a broader range of nutrients from different protein sources like lamb, duck, or turkey. Food rotation is just as simple as using Wellness meal complements! Because many of the foods we’ve featured in our Wellness dog food reviews come in different flavors, all you need to do is switch up your puppy or dog’s food flavors each time you buy a bag. Great, isn’t it! For sure! Each of the Wellness puppy foods we’ve reviewed comes with a helpful feeding guide on the side. If you know the weight of your puppy, you shouldn’t find it too hard to figure out how much he should be eating with each mealtime given his life stage. As puppies need to eat regularly frequently- and different breeds are gonna have different mealtime requirements- you might find yourself feeding your grown-up canines at a different time from your puppy or puppies. Similarly, smaller dogs like Yorkies will require more meals throughout the day than larger dogs such as Rottweilers, so do check our breed-specific advice and have a look at what’s best for your particular little one. Last but not least, the feeding suggestions on dry food packets relate to dry food alone. If you’re planning to mix up some wet food in there, Wellness canned foods also give a helpful idea of how you can substitute wet food for dry.